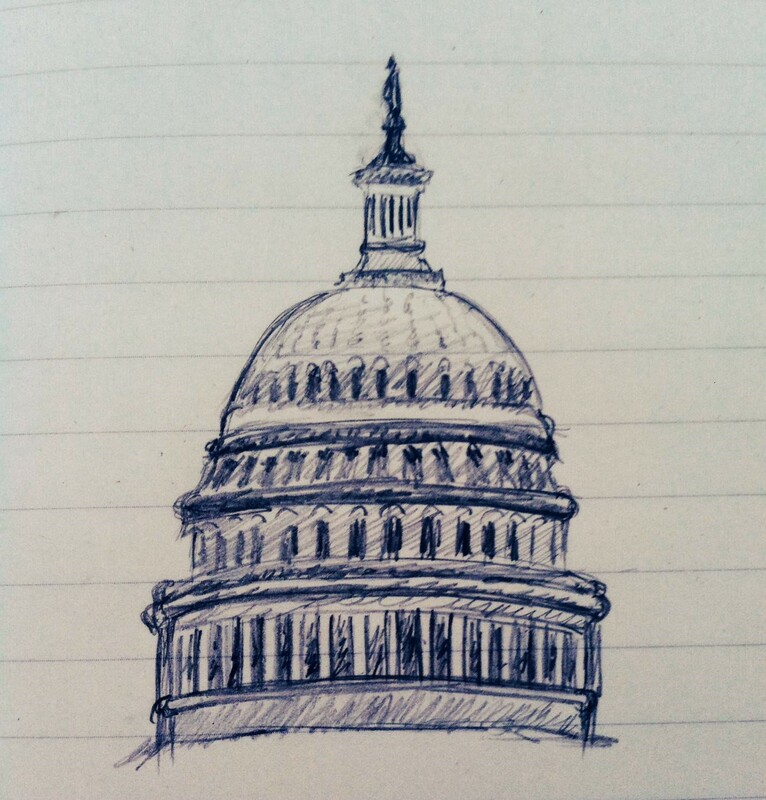 The Capitol Dome and Its Two Cities | Where's My Eraser? For a year after I graduated from college, I worked as an educator in the shadow of one of the weightiest symbols in the world, the embodiment of all of the ideals that make up the great ideological experiment that is America. The Capitol Dome feels omnipresent when one travels around Washington, DC, and the city planners have made sure of that over the years. Only a handful of buildings in the city are taller. The massive Statue of Freedom graces the top of the Dome. It’s always brilliantly lit at night. Standing on the National Mall, I always felt like I had fallen into a postcard. Surrounded by museums and monuments with the Capitol on one end and the Lincoln Memorial on the other, my brain could never compute that that place was real. It felt like a movie. It felt like a song. It was just too grand to actually exist. It’s difficult to describe just how thoroughly that space embodies what we are always told America is. But the Dome can also be seen from a distance. I used to see that gleaming white structure at least a few times a day during my commute to and from some of the poorest neighborhoods in the country. One of those neighborhoods was Anacostia, where Frederick Douglass once made his home. Cedar Hill, his estate, is half a block from an adult learning center where I tutored students during my year of AmeriCorps service. From atop that hill, one can take in a spectacular view of the city, complete with the Capitol Dome. One of America’s greatest symbols is practically within a stone’s throw. Descend back down the hill, and it couldn’t feel further away. Anacostia faces the same issues as so many poverty-stricken neighborhoods around the nation: crime, drug abuse, under-resourced schools, unemployment, poor healthcare. A historic area that once held so much promise for the African American community of Washington, DC now has so few opportunities to realize any semblance of prosperity. I worked with many students in other under-privileged neighborhoods around the city. In Congress Heights, I taught GED students, many of whom were parolees for offenses that had helped them make some cash in a veritable employment desert. In Columbia Heights, I worked with Latino youth who were immigrants or the children of immigrants who came to the US in search of the American Dream. While teaching my adult students basic reading, writing, and math skills, I couldn’t help but consider the irony of their lifelong struggles while living oh-so-close to the enduring symbols of American opportunity that we’ve erected over the years. I also had the sense that my students felt that the physical spaces of postcard DC weren’t created for them, the locals of the city. I never heard a student tell me that he or she had spent a day rubbing elbows with tourists on the National Mall, even though everything there can be enjoyed for free, but that didn’t surprise me. I often felt like I was in a Super Mario game when I traveled by metro from the Mall to a neighborhood east of the Anacostia River. You hop in a pipe in one world and pop out in a totally different one. I can imagine the cognitive dissonance would be tough for them to manage. Sometimes, it made me angry. It was hard for me to go from gleaming white marble to crumbling buildings in a matter of minutes and not feel some resentment. I don’t know what my students thought or felt when they looked at the Capitol Dome, but I wish I would have asked them. Did they resent this clash between ideal and reality that happened in such close proximity to them? It’s hard to say, but perhaps they didn’t. Poverty, and the lack of access to the American Dream, was all they knew. Poverty isn’t just about money. It’s an entrenched condition that keeps people from being able to take advantage of opportunities when they present themselves. Sometimes, it keeps people from knowing what is even possible. Despite these hardships, I believe that things can change. The Capitol Dome is undergoing a major renovation over the next couple of years. Even with constant maintenance, everything that’s built to last needs a major overhaul from time to time. There’s no silver bullet that will make the postcard version of Washington, DC, and the real-life, neighborhood version of it come into alignment. But education could help give the people of DC and cities like it a fighting chance. Despite years of hardship, the students in my classroom understood that their second chance at education might just be their shot at a better life. Those were some of the hardest-working people I’ve ever met. It’s not easy to make up for lost time. Our country and its leaders stand to learn a lot from people like my students—people who try to turn back the clock and make things right. There’s still time to make the promise of that Dome a reality. This entry was posted in Adult Education, Education Policy, Nonprofit Education, Teaching and tagged achievement gap, American Dream, DC, edchat, Education on July 9, 2014 by Chris Thelen.